Universal set of various terrains for each battle game - Forest, Hills, Rocks - new and improved! Set includes 12 terrain models! Excellent set as the tournament base for clubs and individual players. 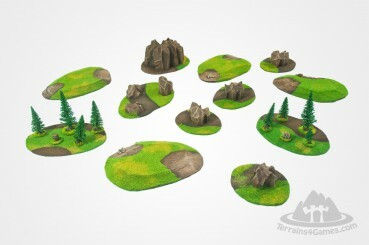 Universal set of various terrains for each battle game - Forest, Hills or Rocks. Set includes 5 terrain models! Excellent set as the tournament base for clubs and individual players. Universal set of various terrains for each battle game - Forest, Hills or Rocks. Set includes 7 terrain models! Excellent set as the tournament base for clubs and individual players.